Danigral - 2 out of 5. Trap card. 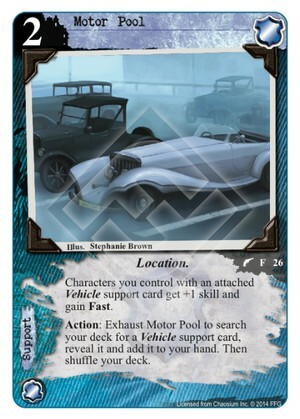 It may look like a form of card advantage, but really it’s a part of a three-card combo: you need this out, a character to attach a vehicle to, and a vehicle attachment to get any real benefit from it. The best I can see it using Snowmobile or Military Bike. Of course, you can pull non-attachment vehicles too. mnBroncos - 2 out of 5. I can never rate a card that gets me a card worse than a 2. Card advantage is rare in this game outside of MU so anything that keeps your hand full, even if it is just for a card you end up resourcing isn’t a bad thing at all. Obtuse - 1 out of 5. So I can exhaust this to get Snowmobile? Are there any other good vehicle attachments? Nope? With as bad as most of the cards this would tutor for you are, they should come into play. livingend 1 out of 5. The only thing this does is ensure that you have a bad Agency card in hand to resource each turn. However, this highly dubious card advantage engine comes with downside of having to put cards in your deck that are plain unplayable. There just aren’t enough good vehicles to make this worth running. Doesn’t matter that they also provide +1 skill and Fast now. Verdict: I ran out of snarky closing comments for atrocious cards. WWDrakey & Ire - 2 out of 5. Vehicles… well, Barque Miskatonic and Franklin Automobile ain’t horrible, so searching for them might even be worthwhile. Patrol Wagon, Military Bike, Snowmobile and Meat Wagon would likely be the only attachments you’d even consider for the +1 skill/Fast part. Who are we kidding? We’re not giving this a one, simply because it gives you a card (usually to domain) each turn, as well as being just the kind of silly jank we find endearing.